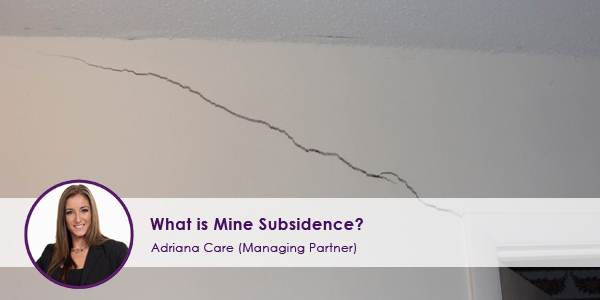 This article explains in plain English what mine subsidence is and what are the issues when buying a property in a mine subsidence area. What are mine subsidence districts? Mine Subsidence Districts are areas that can potentially be affected by ground movement as a result of underground mining, particularly coal mining. Structures within these districts must adhere to building guidelines so they can withstand ground movement. These controls are overseen and implemented by the Mine Subsidence Board. When buying a property, the purchaser is notified that they are buying in a Mine Subsidence District at the time of purchase. Is mine subsidence high risk? In general, mine subsidence is not high risk but there are always some risks when building in a mine subsidence area. The risk increases if the property is built near, or on top of an old mine. Risks such as landslides increase within these areas. As long as your property is not in one of these areas then it is fine. Anywhere not near or on a landfill are treated as normal property. To find out whether your property is at risk, contact a valuer. Local valuers know the area where you plan to purchase a property. They are also able to contact council about mine subsidence areas. In general, if the valuer is unsure whether the area is a high or low risk, the banks automatically assume it is a high risk area. Can I cover my house for mine subsidence damage? Any surface improvements that the Mine Subsidence Board authorises are protected by the Mine Subsidence Act of 1961. This means, that any damage to authorised improvements as a result of mine subsidence is covered by the Board, which is funded by a levy on the New South Wales mining industry. If a building was constructed before the Mining Subsidence District was declared, or the building is outside of the district, then you are automatically covered for mine subsidence damage. It can be difficult to get cover from insurers for certain properties in a mine subsidence district. What is an MSB certificate? A Mine Subsidence Board (MSB) certificate declares that you have met certain Board requirements. Many banks will not lend money to purchase a home in a Mine Subsidence District unless a certificate has been obtained. Section 15B Certificate: A Section 15B Certificate relates to whether the Board requirements for improvements and subdivisions has been met. If these improvements meet Board requirements, then they are eligible for compensation if mine subsidence damage occurs. Section 15C Certificate: A Section 15C Certificate identifies whether or not a claim has been previously paid, or is awaiting assessment of existing mine subsidence damage to a property. What areas are affected by mine subsidence? Newer PostDo I need to pay stamp duty on a family transfer?